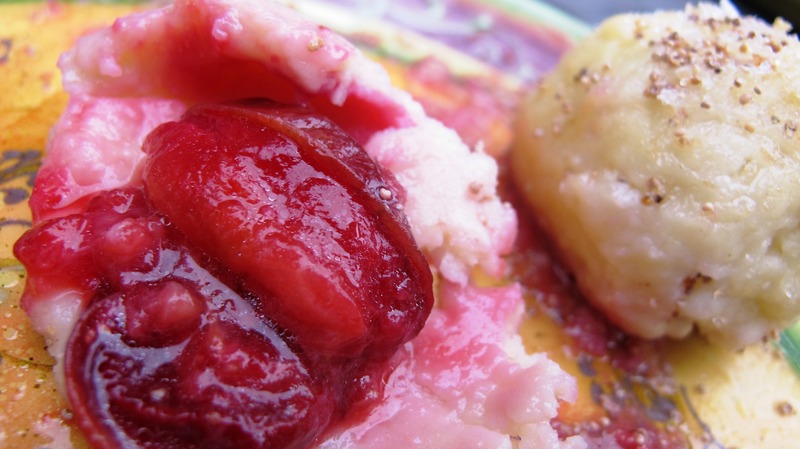 Slovak plum dumplings are a fine late summer dessert made with those slender little Damson plums you sometimes find at the farmer’s market. Choux pastry is stuffed with the grape sized plums, boiled and then served with a dusting of sugary poppy seeds, toasted bread crumbs and melted butter. The dish takes less than 20 minutes to make, start to finish. In Slovakia you’ll find people may eat them as a meal instead of dessert. Heat the milk and butter until hot, then sprinkle in the salt and flour, slowly mixing it in until a paste. Remove from heat, then beat in the egg until the dough pulls from the sides of the pot, and is shiny. When cool to the touch, roll out about 12 golf ball sized balls of dough. Flatten a dough ball and place a plum in the middle of it, then pinch the dough around it and roll it in the palm of your hands to make it round again. You can pit the plums first if you like. Continue with the other plums and dough balls. Boil a pot of water and place the dumplings in the water, plucking them out when they rise to the top of the pot, within 2-3 minutes. Roll the dumplings in the melted butter, then in the sugar and bread crumbs. Serve them on a plate and sprinkle with ground poppy seeds (I toasted them first and then used a mortar and pestle to grind them). Slovaks use black poppy seeds, but this time I used white as that’s all I had on hand. Oh my goodness, how ironic that I should log into Pauline’s Cookbook only to find the front page with a picture of plum dumplings, we had them for dinner tonight, yummy. Fresh plums off the tree are the best for this recipe. When you make them once, you want to make more. PS: where did you get this recipe from? Every Slovak cookbook I have and the recipe my mum has from her mother from Pivnica, the pastry is not choux but it is a potato pastry (sort of like the pastry you use to make Italian gnocchi) which is kneaded and then you take a lump of it and you put a hole in the middle and place a plum that is cut in half with a sugar cube in the middle and encase it in the pastry and the dumplings are then boiled. This is the first different variation of the plum dumpling that I had seen..interesting. Thank you for sharing a different plum dumpling. Hi there. I got it from my aunt in Dolny Kubin. We made it together one night when I visited last year.